100% Organic Detox Supplement For a Happy, Healthy, Longer Life. When pet owners think of pet nutrition, they, of course, go immediately to a whole food diet and the necessary balance of the diet. 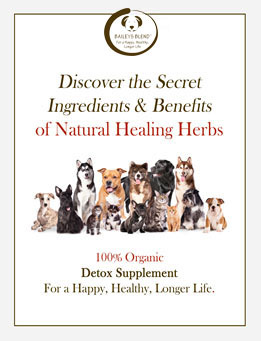 But the next thought is the importance of the absorption of the nutrients within the diet, which is where nutritive herb supplements for dogs play an important part of good and balanced nutrition. Nutritive herb supplements are classified by the specific nutritional value they provide. They can enhance your dog's diet in a variety of ways. It's becoming increasingly clear that to achieve the best health ever in pets, they need to consume a balanced diet along with absorbable vitamins, minerals and trace minerals. These can be achieved with pet vitamins, herbs and supplements, which offer a concentrated, synergistic and nutrient-rich balance. Providing supplements for puppies when they are young can be a good way to start the habit of getting the right nutrition to support a long, healthy life. At Bailey's Blend, you will find 100% organic, all natural dog vitamins and herb supplements so you can be sure that you are getting the finest quality available anywhere. Made of premium quality organic ingredients, Bailey's Blend dogs natural vitamins and supplements are the perfect dose of health that can be added to your dog's regular diet. All Bailey's Blend herbal products are ground to a fine powder so that they can be easily digested. They are all made naturally with ingredients which are formulated into a unique proprietary blend. Regular consumption of these organic herbs found in Bailey's Blend, can help reduce the levels of toxicity and inflammation in your dog's system. Depending on the specific needs of your dog, you can pick from formulas that are meant for Joint Rejuvenation, Peak Performance or as an Intensive Care healing supplement that lets your pet better fight cancer, Cushing's disease, obesity and other serious and chronic ailments. With prolonged use of Bailey's Blend, all natural organic herbal dog supplements, your pet will develop a stronger immune system, reduced inflammation and allergy symptoms, prevention of degenerative diseases, improved digestion, relief from arthritic pain, improvement in the health of skin and coat, improved mood and enhanced levels of energy. 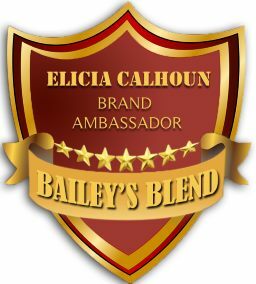 The propriety blend of herbs and antioxidants found in Bailey's Blend products are free of side effects. Bailey's Blend products are also effective on cats, horses and livestock. It is a complete care package for their health that nourishes them from within. *You will continue to receive periodic e-mails with helpful tips & specials.